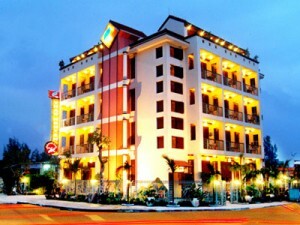 Grassland Hotel is built towards the east where you can enjoy the sea-breeze and sunlight flooding into your room. It is situated in a traditional-style architectural complex of garden houses, villas, and trees – a retreat for any traveller. The hotel is a tranquil place suitable for a long stay if you so desire. Coming to Grassland Hotel will give you a haven away from the bustle of the city. The hotel’s logo is an immense natural scene embodying the image of bird’s wings stylised with the pastoral and gentle blue, spreading over the old quarter of Hoi An. + All rates are subject to change without notice..